Alice Eve Cohen is back! I read her first memoir “What I thought I knew” for Elle Magazine back in 2009, and it won the Elle Grand Prix Prize for Best Non-fiction that year. Receiving her next memoir was quite a gift! 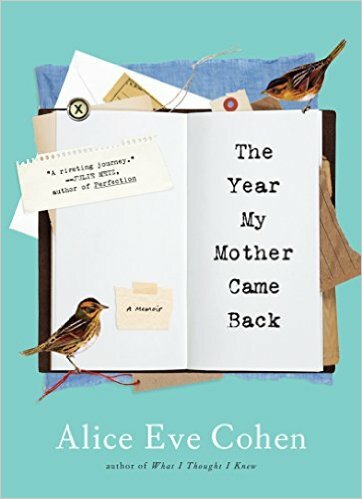 She writes about connections between Mothers and Daughters that will leave you reaching for your Mother or Daughter. The writing itself is beautiful, so beautiful; in fact, that you are vividly drawn in to her story. When her Mothers hand touches hers, you can almost feel it yourself. 31 years after the death of her Mother, Alice is being hit from every angle again! Being diagnosed with Stage Zero Breast Cancer brings back a lot of memories of her Mother, Louise. Her Mother was also diagnosed with Breast Cancer at the same age Alice is now (47). Her mother beat the cancer only to lose her life when she had a stroke ten years later. Alice and her husband, Michael have two daughters. Julia was adopted before she gave birth to her daughter, Elaina. Both girls are entering very important stages in their lives. Alaina needs surgery to repair the length of her legs, and Julia is about to go off to college, but wants to find her birth mother beforehand. As Alice begins treatment for her breast cancer, her Mother comes to her. She sits with her, holds her hand, and talks to her….reminds her of their bond. This is a brilliant story of love, and the relationships between Mother and Daughter. You will never look at your Mother or daughter the same. I dare you not to be moved!